Lewa Wildlife Conservancy shows how conservation and community are bucking the poaching trend that kills thousands. Lewa Downs, Kenya – Few thought it would work. Even the experts said no chance. But 24 hours after the road underpass opened, the bull elephant slowly stepped through and re-established safe passage on an ancient trail. Reaching high into the clouds, Mount Kenya is a waypoint on the elephant’s inbuilt GPS. For centuries herds in this part of Africa have trodden the route back and forth across the equator to Mount Marsabit in the north. Then came agricultural fields. And a road network. The old elephant paths were blocked by either cash crops of flowers and tomatoes, or by lorries thundering on tarmac through the foothills. The elephants took the easy route and fed themselves along the way. Entire crops were destroyed overnight and livelihoods ruined. Elephants were sometimes killed in retaliation. The corridor fully opened in 2011 and has locally eased an intense conflict between man and beast, familiar across Africa. But it is also part of a wider effort that has brought farmers and villagers more onside in the fight against poaching. The horrifying slaughter of the African elephant is headline news: Tens of thousands are killed each year, their tusks hacked out, their bodies left to rot. Herds have been devastated by sophisticated criminal gangs feeding high demand for ivory, especially in China. Rhino, too, are being targeted with calamitous effect with nearly 1,400 slaughtered across the continent last year. Trying to protect these species is deadly. It’s estimated on average that 100 rangers are killed each year in the line of duty. Winnie Kiiru is from the group Stop Ivory, who recently helped organise the burning of more than 105 tonnes of confiscated elephant tusks and rhino horn in Nairobi. The elephant corridor leads north from the slopes of Mount Kenya on to the wide, open ranges of Lewa Downs and beyond. Here the story bucks the trend, demonstrating just what it takes to beat the criminals. The vehicle jolts along the dusty earth track from the airfield. Alongside are grazing herds of impala and zebra. In the distance, small groups of elephant slowly move under the boundless African sky. Suddenly an abrupt halt, the engine is cut as the driver whispers urgently: “There, rhino!” And 300 metres away, the rhinoceros was lying down, its curved, pointed horn – so valued by the poachers – poking through the high grass. Formerly a cattle ranch, these lands are now a thriving wildlife conservancy with about 72 critically endangered black rhino living wild, but protected on 93,000 rolling acres. Together with the hundreds of elephant that pass through Lewa every year, one would think the conservancy would be a prime target for poachers. 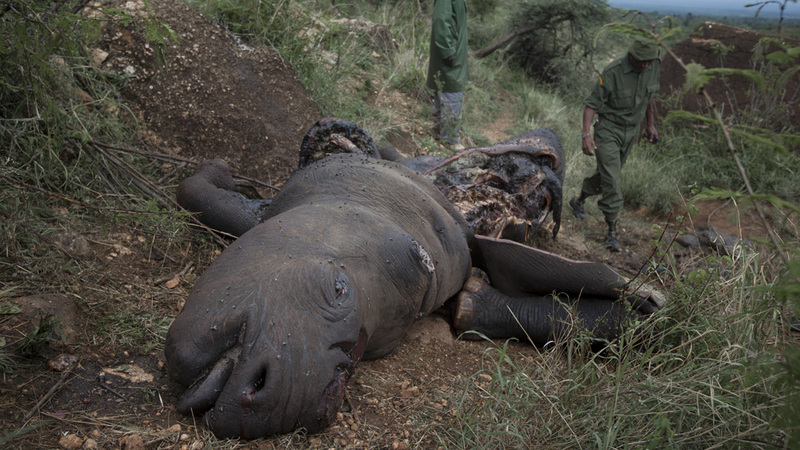 But the last rhino killed by poachers’ guns was three years ago in 2013. Elephant poaching in the region is down, too, now at its lowest level in the last six years. The success is in part because of the level of protection provided for the black rhino, which represent 12 percent of the remaining population in Kenya. There are rangers with armed patrols, plus a helicopter that can reach remote parts fast. All wildlife security operations are controlled from a central office where TV screens monitor the live movements of tagged rhinos and elephants. There are sniffer dogs, too. A handler and his bloodhound engaged in an exercise as they tracked down a man to his hideout in a ravine, simply from sniffing the imprint of his shoe in the dust. 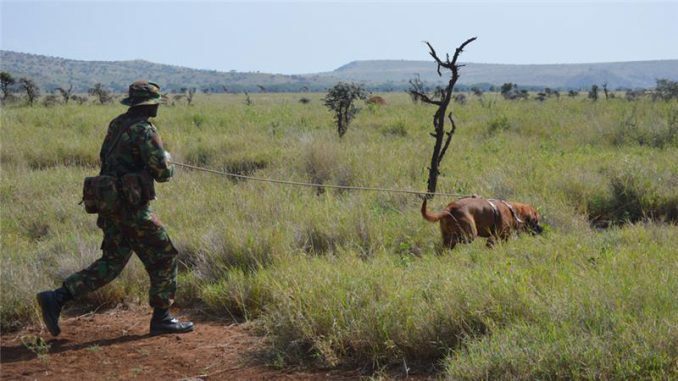 But these days, the patrols deal more with cattle rustlers than poachers. Confrontations with the latter are rare. “Actually I’d say when it comes to poaching, our security effort represents just 20 percent of our success,” said Watson. “The rest comes through the community. Suddenly there are thousands of eyes and ears on the ground ready to report illegal activities because it’s in the community interest. The equation is simple: Manage your land, look after your wildlife, and bank the tourist dollar. Easier said than done in areas of conflict such as the DRC and Congo, but it’s working here. Livestock sales at helpfully cranked-up prices and micro-credit schemes also help the cause. New schools have been built and educational bursaries provided. Chief ranger John Palmeri has been patrolling Lewa lands for more than 20 years. Lewa is undoubtedly expensive to run. Security costs in 2015 ran at $1.23m and the conservancy itself spent nearly $1.5m on logistics and wildlife activities. The flip side is the income generated by luxury tourist lodges plus donations and grants to ongoing projects. There are few parks or reserves on the continent that have the resources, stability or government support to counter the powerful criminal syndicates. These organisations especially thrive in the chaos of unstable governance, with corruption endemic among military, government and judicial officials, and where armed militias wreak havoc. But the Lewa experience does demonstrate that a coupling of conservation and community, together with careful financial management, will go far in this bloody war against wildlife crime. Is Trump Buhari’s ace in the pack?